First basic radiographs and study models are taken to aid Dr. Wetmore in the treatment planning of your case. In certain situations it is advantageous to attain a CT scan for a 3-D computer model of your jawbones. Once surgical guides are fabricated and the width and length of implant for your particular needs are selected it is time to schedule the surgical appointment. We offer sedation based upon your particular needs. At the surgical appointment, the gums are moved aside with a small incision. 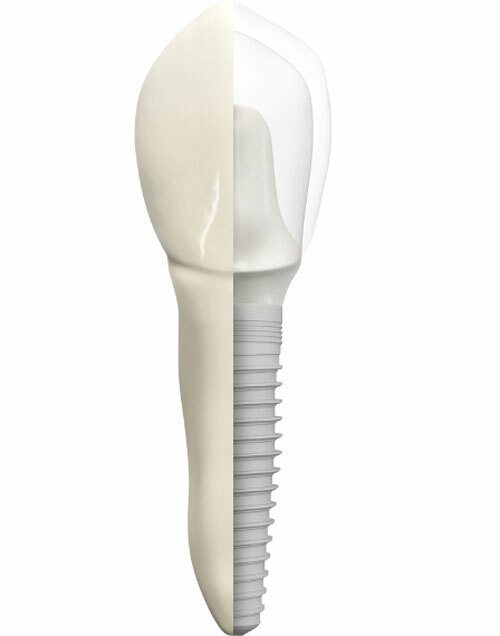 Next the Dental implant which is a small titanium screw is placed into your jaw. If there is any grafting required it would also be completed at this time. Typically several sutures are placed, although in some ideal situations none are required. Over the course of the next two to six months the implant is allowed to osseointegrate or bond with your bone. Typically during this time period some form of temporary artificial tooth is fabricated for you, based on your specific needs and desires. In certain situations it is even possible to temporize the implant itself on the same day as placement, but this option is not recommended for all of our patients. After the implant has successful integrated with your bone, an abutment, which is a metal or ceramic post that sticks up out of your gums will be placed on the implant. This abutment provides the structural foundation for the placement of your permanent artificial tooth. Sometimes this step requires a second minor surgical procedure to uncover the implant buried under your gums. Whenever possible a titanium healing abutment is placed at the time of surgery that allows us to avoid this. Depending upon the number of implants placed and the type of restoration planned your new teeth can be screwed or cemented down on the implants. After the final impression is taken it usually takes about two weeks to fabricate your custom restoration. If you have elected to attach your denture to implants than they will either clip to a bar, or attach to a custom zest locator snap.